The instruments of the premium Series 2000 satisfy the highest musical standards and are excellent for use in music and grade schools. 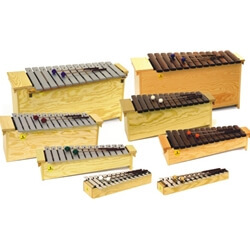 They feature solid wood resonance boxes (except for glockenspiels) with handles for easy transport, which also serve as supports for optional stands. This complete diatonic set includes the SGD Soprano Glockenspiel; the AGD Alto Glockenspiel; the SM2000 Soprano Metallophone; the AM2000 Alto Metallophone; the BM2000 Bass Metallophone; the SX2000 Soprano Xylophone; the AX2000 Alto Xylophone; and the BX2000 Bass Xylophone. Shipping costs are estimated. Please call for exact shipping costs.